Are you considering tooth replacement options but aren't sure if dentures are the right choice for you? 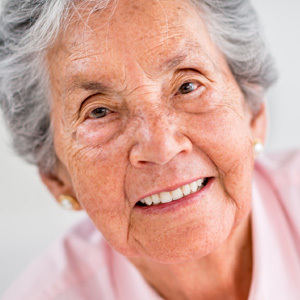 McLean, VA, dentists Dr. Cecilia Gyllenhoff and Dr. Samuel Cappiello of McLean Dental Care share a few benefits of full and partial dentures. It's not uncommon to feel less confident after you've lost your teeth. Dentures restore your bright, healthy smile, which may help you feel more at ease at work and in social situations. Once your teeth are gone, your cheeks tend to collapse a little, which can make you look older. Dentures help support your cheeks and may help you appear a little more youthful. Decaying or missing teeth can make eating difficult. If eating hurts or it's too hard to chew foods, you may have restricted your diets to liquids or soft foods. A soft diet can get boring after a while and may not contain all the nutrients you need to stay healthy. Thanks to your new dentures, you'll be able to take a bite of a sandwich or enjoy a chicken dinner at your favorite restaurant once again. If you're missing all or a significant portion of your teeth, you've probably noticed that it's difficult to pronounce certain sounds and words clearly. Replacing your teeth with dentures can improve your speech and make it easier for other people to understand what you're saying. Partial dentures will help you keep any remaining teeth in good shape. When you only have a few teeth, those teeth are subject to tremendous wear and tear. Dentures take the burden off your remaining teeth, which will help them stay strong and healthy. Would you like to find out if dentures can help you regain your sparkling smile? Call McLean, VA, dentists Drs. Cecilia Gyllenhoff and Samuel Cappiello of McLean Dental Care at (703) 734-0100 to schedule an appointment. Are you considering getting dentures for the first time or replacing your existing dentures but aren't sure which type of dentures are best for you? Dr. Cecilia Gyllenhoff and Dr. Samuel Cappiello, your McLean, VA dentists at McLean Dental Care share information that will help you make a decision. Full dentures feature a row of false teeth on a pink base. They're used when you need to replace both your upper and lower teeth. The dentures rest against your gums and the roof of your mouth. Changes to your mouth and gums during the first few months after teeth extraction will affect the fit of your dentures. Returning to your dentist's office for adjustments will ensure that your new dentures are comfortable and fit well. As the name implies, you'll receive immediate dentures immediately after your teeth are extracted. A few weeks before removing your remaining teeth, your dentist will make an impression of your mouth which will be used to create your new dentures. You'll visit your dentist periodically for adjustments that will ensure that your dentures fit well and don't slip or irritate your gums. Partial dentures are a good choice if you still have some remaining healthy teeth. These dentures are removable and are attached to your teeth with hooks. Overdentures fit over your teeth and are a good choice if you have fragments of teeth remaining in your mouth. Although only parts of your teeth may remain, in many cases, the roots are still strong. The fragments and roots provide a stable base for your dentures and also help reduce jawbone shrinkage, which can occur after tooth loss. 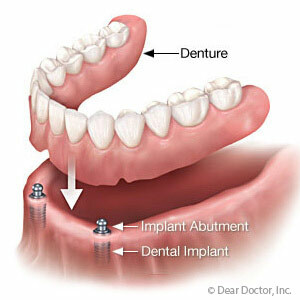 Dental implants offer an excellent way to support your dentures. 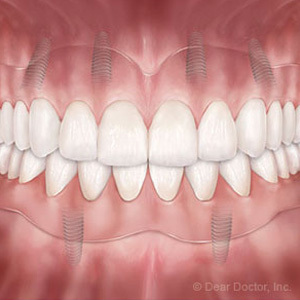 Dental implants replace tooth roots and are placed in small openings made in your jawbone. Over the course of a few months, the implants bond to your bone and offer a strong foundation for your dentures. Two to four implants can support an upper or lower denture. Dentures improve your appearance and restore your ability to chew and speak clearly. Call Dr. Cecilia Gyllenhoff and Dr. Samuel Cappiello, your McLean, VA dentists at McLean Dental Care, at (703) 734-0100 to schedule an appointment to learn more about your denture options.